Need more proof that 15-year-old JoJo Siwa is making the transition from child superstar to YouTube heavyweight? After receiving the collab stamp of approval from a slew of flagship YouTubers in December — including Ace Family patriarch Austin McBroom, vlogger David Dobrik, and mukbang queen Trisha Paytas — Siwa most recently made headlines for a public spat with one of the biggest stars on earth, Justin Bieber. 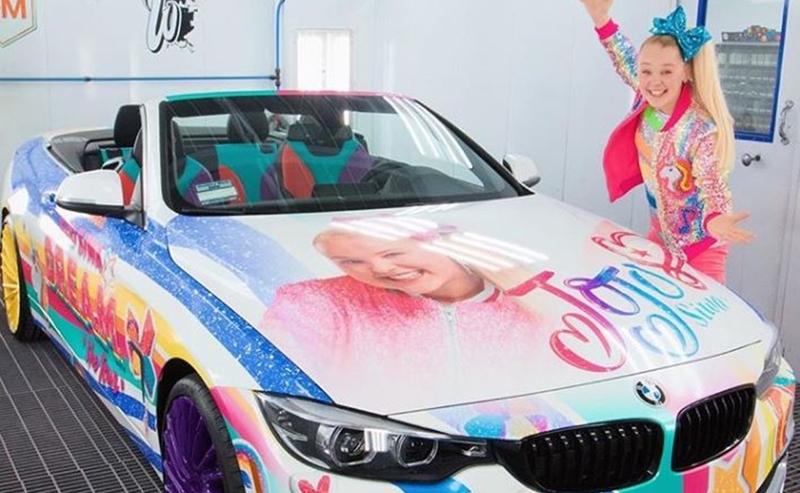 On Instagram last Friday, Bieber slammed a photo of Siwa’s new BMW, which had been re-fashioned by the auto repair experts at West Coast Customs in Siwa’s notoriously gaudy and whimsical style. The car now features a pastel portrait of Siwa on the hood, and the logo for her forthcoming Nickelodeon tour on the passenger door. “Burn it,” Bieber commented below a photo of the car on Instagram, clearly displeased with the design job. Whether or not Siwa was genuinely wounded by Bieber’s critique, their back-and-forth speaks to her waxing relevance. And the savvy 15-year-old — who frequently showcases the decked-out merch room in her home that’s filled to the brim with all of the products she vends, including hair bows and food — has subsequently reclaimed the ‘burn it’ quip for a series of posts on her own social channels. In one Instagram photo, for instance, Siwa can be seen with a cardboard cutout of the musician sitting in the passenger seat of the polarizing vehicle. Ultimately, Bieber apologized to Siwa on Twitter, insisting that his comment wasn’t meant to be personal. “I have nothing against you, it was the car and the colors I didn’t like,” he wrote on Sunday. “I really hope you didn’t think it was malicious or mean spirited.” Siwa took the apology in stride, telling him that they could call a truce if he agreed to perform at her 16th birthday. Perhaps the burgeoning vlogger-musician already has her next collab in the works.